Just a quick note to update you on a couple of story appearances that are due out in the next few months. 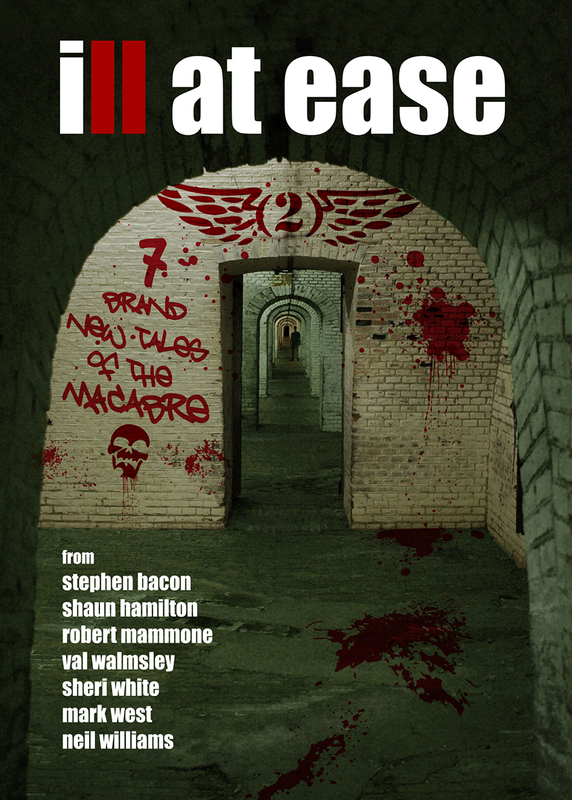 Firstly, I’ll have a story in Ill at Ease 2. It’s an anthology of original stories featuring the 7 writers listed on the cover – Shaun Hamilton, Robert Mammone, Val Walmsley, Sheri White, Mark West, Neil Williams and me. Neil also created the superb artwork you see above. My tale, Double Helix, deals with regret, recrimination and terminal illness. Despite that, I think it’s one of the most optimistic stories I’ve ever written. Secondly is an appearance in the anthology For the Night Is Dark, edited by Ross Warren and published by Crystal Lake Publishing. My story is called Room to Thrive and is about a group of lads who explore the flat of a recently-dead tenant. And, thirdly, my story Pseudonym will make its appearance in the Pentanth (an anthology featuring 5 different writers) called Anatomy of Death – in 5 sleazy pieces edited by Mark West and published by Hersham Horror Books. The other contributors are Stephen Volk, John Llewellyn Probert, Johnny Mains and Mark West, so I’m in some fine company. Pseudonym is about an aging pulp writer from the 70s and 80s who has since fallen on hard times; the narrator visits his Suffolk home to conduct an interview and investigate something dark from the writer’s past, but ends up unleashing a powerful supernatural force instead.